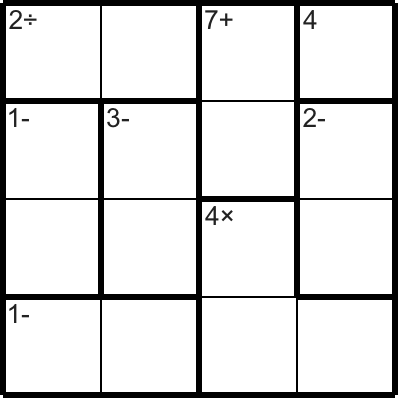 Fill in each square cell in the puzzle with a number between 1 and the size of the grid. 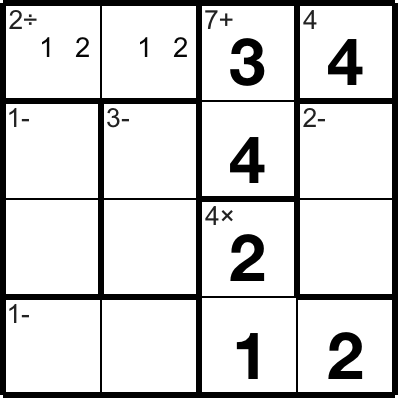 For example, in a 4×4 grid, use the numbers 1, 2, 3, & 4. Use each number exactly once in each row and each column. 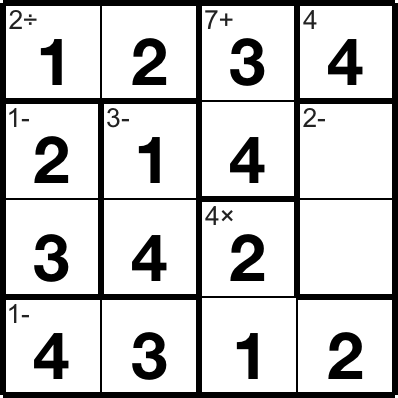 The numbers in each “Cage” (indicated by the heavy lines) must combine — in any order — to produce the cage’s target number using the indicated math operation. 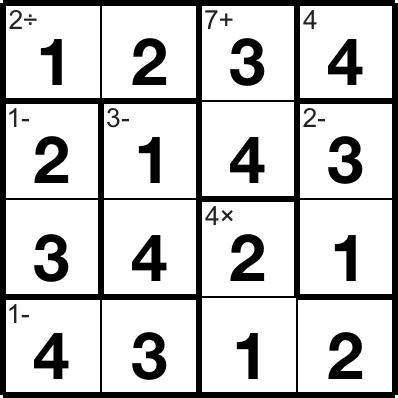 Numbers may be repeated within a cage as long as rule 2 isn’t violated. No guessing is required. 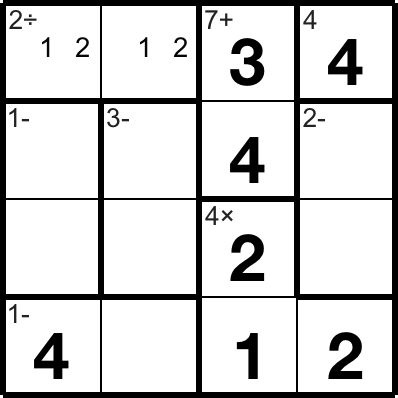 Each puzzle can be solved completely using only logical deduction. Harder puzzles require more complex deductions. That’s all you need to know. The rest is just logical deduction derived from those rules. For more complex deductions, it can be useful to take notes in the puzzle, which you can do by using the right side of the on-screen keyboard, holding down the Shift key while typing on a physical keyboard, or switching to Pencil input with TouchWrite. 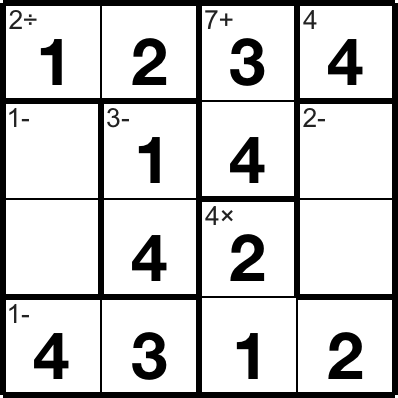 In the 2÷ cage in the upper left, there are only two possibilities — 1 & 2 or 2 & 4. 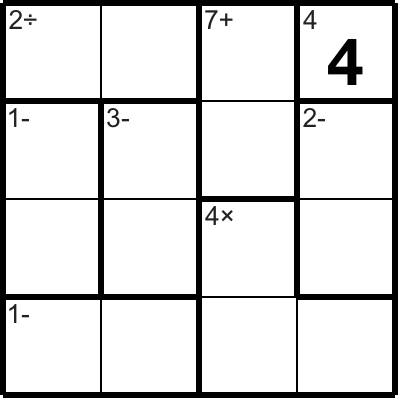 The latter is excluded by the 3 & 4 already in the row, so we can deduce that two cells contain 1 & 2 (in an unknown order). Since knowing this doesn’t let us place any additional numbers immediately, we can use notes to help us remember it for future use. 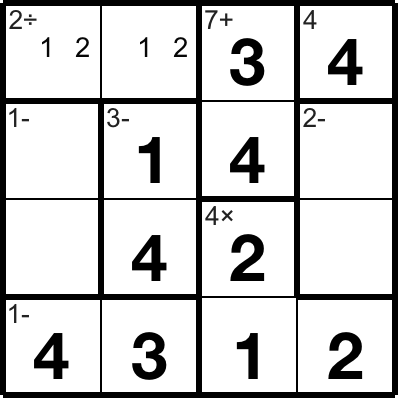 Note that this is just one way to solve this puzzle. 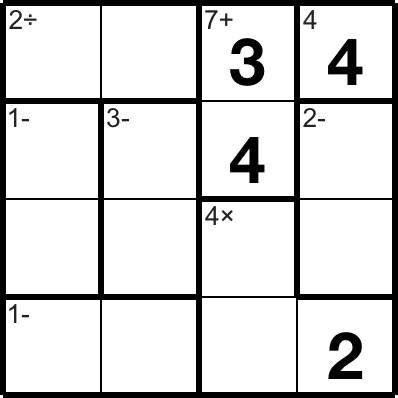 Because this is an Easy puzzle, there is more than one deductive path for solving. With harder puzzles, this is not always the case. 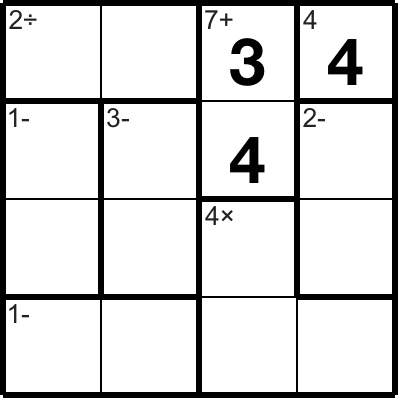 If you’re just getting started with KenKen puzzles, don’t forget you can get hints. Just tap on the icon to fill in a value or remove mistakes. KenKen® is a registered trademark of Nextoy, LLC. All rights reserved. www.kenkenpuzzle.com.